Elemental Joy Cloth Diaper Kit Reuse = Less Cost Wear • Wash • Repeat Save Money With Every Cloth Diaper Change! It’s easy–just wear, wash, repeat and save. Plus, you’ll create less household trash compared to disposable diapers. The one-size diaper covers and one-size absorbent inserts adjust to grow with your little one (8-35 lb. )* for even more savings! Changing Cloth Diapers Every baby has different wetting habits; sometimes more absorbency is needed for sleep, longer periods between diaper changes, or as the baby gets older. Add extra inserts based on your baby’s needs. Add extra inserts for heavy wetters or reduce the amount of time between diaper changes. Use this bucket as your diaper pail. The Elemental Joy Cloth Diaper Kit Includes: 6 Diaper Covers* 12 Inserts* 1 Wet Bag 1 Diaper Pail How It Works • Adjust diaper cover to baby’s size • Fold insert to fit • Place insert in cover • Put on baby, adjust tab snaps to fit waist • After use, toss insert into diaper pail • For wet diapers, wipe cover + replace insert • For soiled diapers, replace cover + insert • Use wet bag for travel Have questions? Our team of cloth diapering experts is here to help: 314-892-1855 *Fit range is approximated and may vary depending on age, size &amp; shape of your baby. Washing Instructions: Wash: Wash warm with detergent.‡ Wash hot (140F/60C) with detergent. Extra rinse. No laundry additives. Tumble dry low or line dry. Dirty Storage: Remove Solids. Store in dry pail/bin. Wash soiled diapers every other day. Note: Mineral based rash creams may stain your diapers. Cod liver oil based creams may cause odor. Use of a liner is recommended when using rash creams. ‡ We recommend detergents that are free of optical brighteners, perfumes, fabric softeners and dyes. I love this kit! I've cloth diapered two children and am on my third now. I have always been a budget diaper type of mom, but when I first started a friend told me not to go cheap on cloth. I've kept my stash smaller so that I can get better quality diapers. 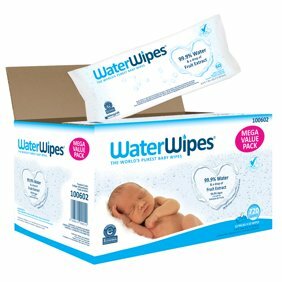 This option gives parents the ability to have very quality diapers for a spectacular price. I love using the plastic bucket it comes in as a diaper pail (as suggested). I can fit 21 soiled diapers in it! The covers are quality, similar to Flip if you're familiar with the cotton babies family of diapers. The inserts are 100% cotton and I would rate the absorbency as a 7/10. Use two for overnights, but one during the day should be perfect. The diaper covers are gender neutral. I am so excited to see quality cloth diapers on the shelves at Walmart! The photo is attempting to show the pail full of soiled diapers. The diaper in the picture is not included. The pail also holds the smell in very well. So for anyone who wants to road trip with cloth but doesn't trust wet bags to do the trick, this will!